An Angelic Song + A Creative Nudge | Are You Being Real? I’ve got a special song to share with you…but 1st, I think it’s important to share the inspiring context behind the song. If you are like me, I’m guessing there is something you have been working on for a while that you haven’t shared yet..am I right? For me, it was releasing video versions of Are You Being Real (I’ve got over 100+ filmed episodes in the can that haven’t seen the light of day), and for singer-songwriter Elisa Rose, it was publicly releasing her album “Breath & Bones” after 2 years. What I’ve found is that while sharing our work with the world can be intimidating, it also creates opportunities for self-discovery, expression, and healing for ourselves and others. So it’s important to not let perfect be the enemy of good. NOW is just as good a time as any to take the next step. 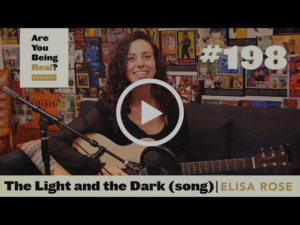 In an effort to follow my own advice and support Elisa’s release, I’m giving you the very first look at this beautiful video recording of Elisa’s acoustic performance of “Light and the Dark” on the Are You Being Real Podcast – click play on the image below. Her voice is angelic and in addition to being my favorite song on her new album, it’s a staple on my “bathtime” playlist. If you’re curious to learn why Elisa waited two and a half years to release her finished album, tune into Episode 198 of Are You Being Real. Elisa and I go deep into her creative process, how spending her childhood on a commune influenced her life, how she deals with negative moods, perfection, and life as an empath. Wishing you a confident, creative, and sharing-filled week! PS: Also, be sure to subscribe to my YouTube channel for future releases of new and classic video episodes (I’ve got a few already up there including the one’s with Ricki Lake and Chris Girbes-Pierce – see below)!